Gardner Denver’s PureAir II is changing the way the world uses oil-free compressed air. By developing a compressor that can run 24 hours a day, Gardner Denver has eliminated the need for oversizing and back-up units that add unnecessary expense. The craftsmanship of the PureAir II is nothing short of the best in the industry. This compressor is ideal for continuous or intermittent operation. Long lasting cast iron, hard chrome-plated cylinders. PTFE guide rings prevent the pistons from contact, raising efficiency. Sealed anti-friction bearings in the upper and lower connecting rod ends for increased life. Strong ductile iron crankshafts are mounted with sealed anti-friction bearings in a rugged cast iron crankcase. Cast iron heads and spring-loaded valves with stainless steel cages, phosphoric bronze seats and Swedish steel discs keep your compressor running cool and offer a longer operating life. Large aluminum cooling fan and low compressor speeds keep the PureAir II crankcase, cylinders and heads running cool, reducing wear and increasing the life of the unit. Maintenance. Keeping the PureAir II up and running is as simple as checking the machine periodically. And, with no oil or fluids to change, there’s little need for costly maintenance. Durability. With the highest reliability in the business, you can be assured that your PureAir II will always be up and running, 24 hours a day. Service. Should you need help with your PureAir II or have any questions about operation or maintenance, your Gardner Denver Service Representative stands ready to serve you. Warranty. All PureAir II units are guaranteed with a one-year warranty on the compressor pump and all other parts and components. Parts. The 24-hour Gardner Denver worldwide parts distribution network can deliver parts and accessories quickly, wherever and whenever they are needed. Expandability. 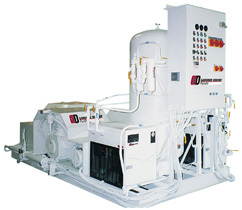 Whether you just need a compressor or a complete compressed air system, Gardner Denver has the products, service and expertise to get your system designed, fabricated and shipped directly to you.